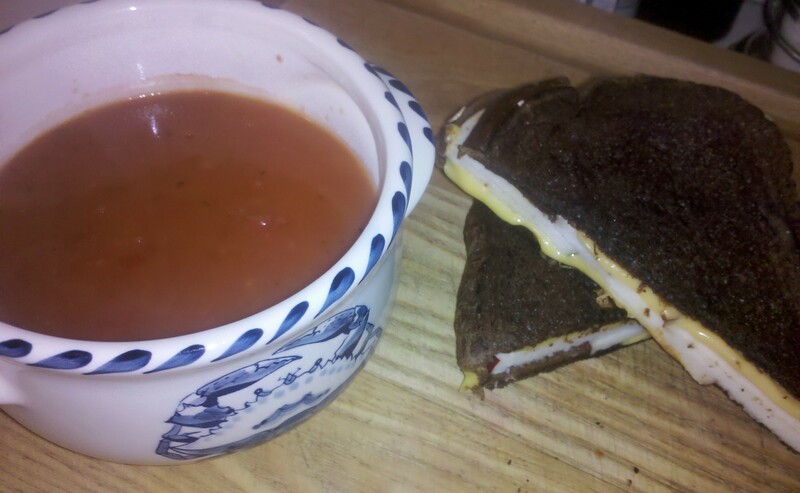 I love grilled cheese sandwiches and tomato bisque. Since Fall is apple season I like to add them to my sandwich. It’s a great combination. I like to head to my local Farmer’s Market for fresh Squaw bread, deli yellow American cheese, Fuji apples, and vine-ripened tomatoes. Heat a cast iron skillet on medium. Put one slice of cheese on the bread, add three whole apple slices, add the other slice of cheese and top with other slice of bread. Spread butter on the outside of sandwich and place in heated skillet. Butter the other slice on the outside and flip while monitoring browning of the sandwich. When toasty on both sides remove from heat and place a lid on for 30 seconds to help melt cheese. Cut in half and serve. Heat the butter in a large soup pot over medium-high heat. Add the bacon and cook until crisp, about 1 minute. Transfer the bacon to a paper towel-lined plate and set aside. Lower the heat to medium, add the onion, carrots, celery, and garlic and cook, covered, stirring occasionally, about 8 minutes. Stir in the flour and cook, stirring, for 3 minutes. Pour in the broth and tomatoes and bring to a boil while whisking constantly. Tie the parsley sprigs, thyme, and bay leaf together with a piece of kitchen twine and add to the pot. Lower the heat and simmer for 30 minutes. Remove from the heat and allow to cool. When the soup base is cool, remove and discard the herb bundle. Working in batches, transfer the mixture to a blender and puree until smooth. Strain the tomato puree through a fine strainer. Return the puree to the pot and reheat over medium heat. 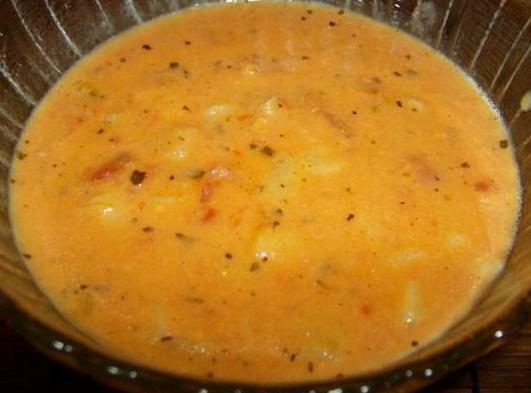 Whisk the heavy cream and salt into the soup and season with pepper to taste and serve. It took me a little while to perfect these, but well worth it. 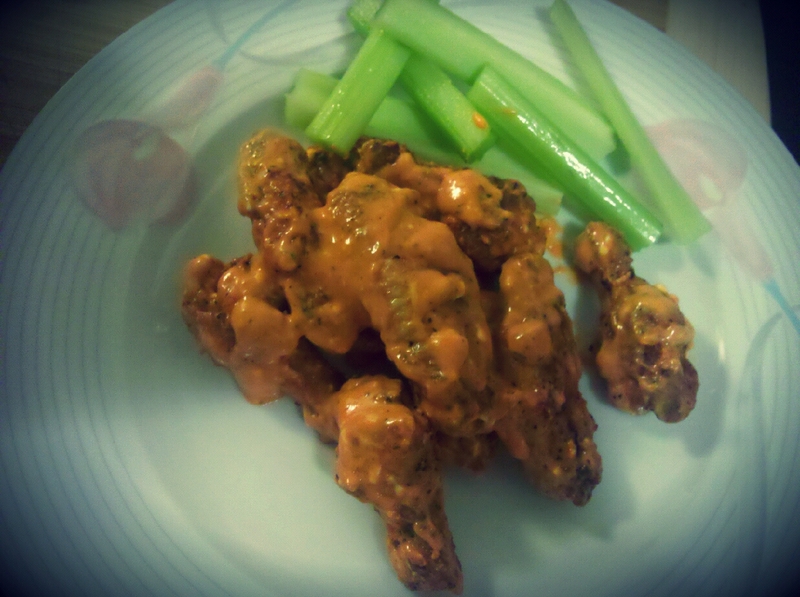 I added cream cheese so it will stick to the wings and whipping cream to make the sauce a little cooler. There is no need for dressing on the side. Heat oil on medium high in a large non stick skillet. Place in wings and sprinkle top with all of the salt and pepper. Fry for 5 minutes and then turn and fry for another 5 minutes. Place wings on non stick foil on a baking sheet. Sprinkle with lemon pepper on both sides. Bake for 20 minutes. When done coat and toss with wing sauce. Let stand for 5 minutes and serve. Heat sauce on medium. Add cream cheese until incorporated, but still a little lumpy. Add whipping cream and heat for another 30 seconds. Serve with baked potato (see recipe) and or celery sticks. If you like an extra crunch on your wings sprinkle with homemade bacon bits. Delish!! I am a potato lover! There is nothing like a good baked potato. I like to eat the skin and all. With that said I want the skin a little crunchy. I bake it in the oven without foil..
Poke potato with a fork a few times and wrap with a wet paper towel. Place in microwave for 3 minutes. Turn and cook for another 3 minutes. Place in a bowl and coat with oil and salt. Place on oven rack with foil on rack below to catch any drippings. Bake for 20 minutes. 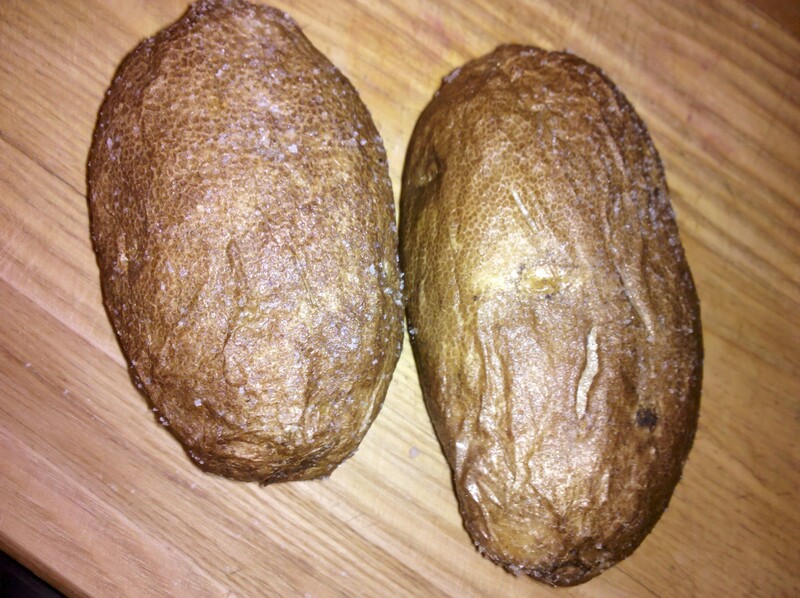 Slit down the middle and push together to push up soft potato. Top with your favorites…butter, sour cream, chives, or homemade bacon bits. I love this Soup. My grandmother made this all the time when I was little, so my mother and I make it all the time as well. My friends would beg for this soup when they weren’t feeling well. It comforts you. Saute tomato and onion in a large soup pot with a little bit of water. Keep sauteing until you gradually have added all 12 cups of water then add broth. Bring to a boil and boil for 5 minutes. Add the potatoes and diced tomatoes and slow boil around 10 minutes or until potatoes are done. Remove from heat and add cheese. Cover and let stand for 5 minutes. Remove and add salt and pepper to taste. Serve and enjoy. A trio meant to go together. 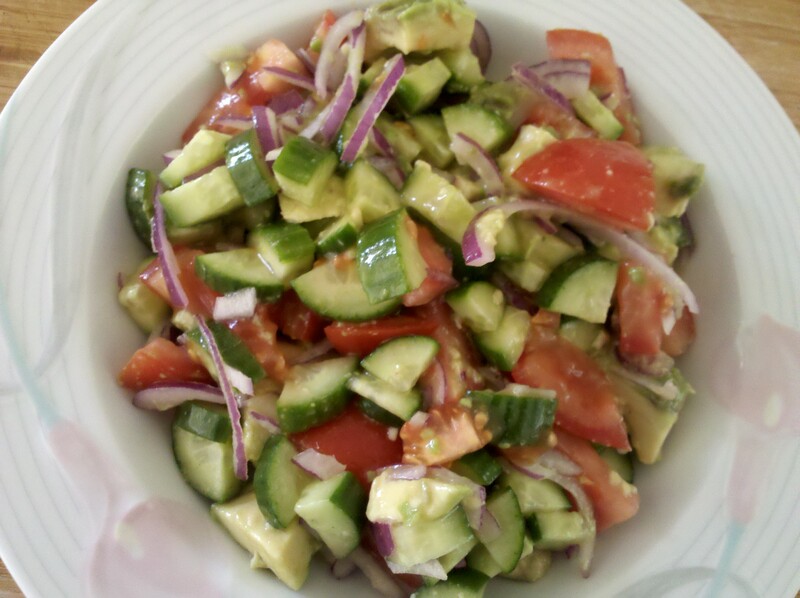 A simple salad, not so simple in flavor. This is so easy and fresh. Toss together with a nice Blush Wine Vinaigrette and serve chilled. It’s pretty simple to make your own rice pilaf. 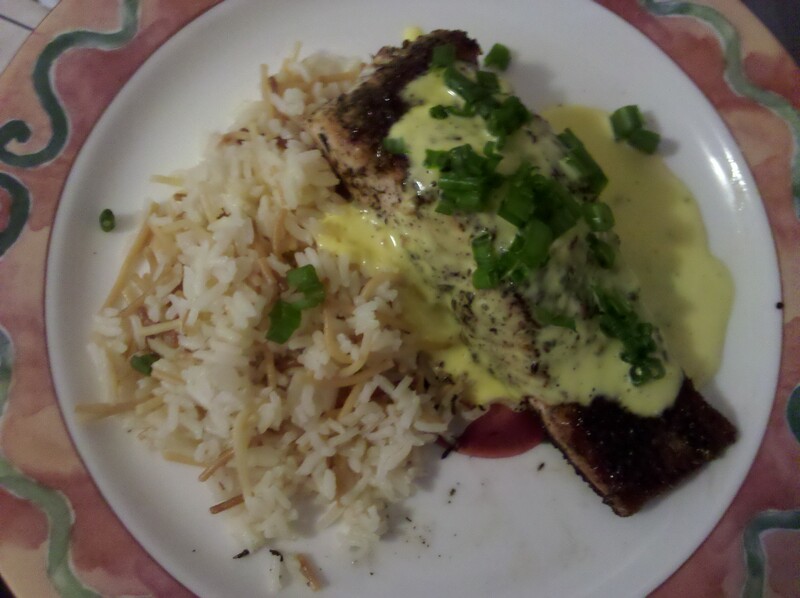 The sauce is so delicious with the salmon you’re family will love it. Combine all herbs and salt and grind with a mortal pestle until smooth. Coat the tops of the salmon. Place 2 tablespoons olive oil or better yet Avocado oil if you have it in a medium high heat frying pan large enough for 4 filets if possible. Sear herb side down for 3 minutes and turn and cook for an additional 2 minutes. Put yolks in a food processor and blend, add butter a little at a time until incorporated. Add the lemon juice and stir. Pour over Salmon filets and top with chives. Place oil in a saucepan and heat on medium high. Put in spaghetti and saute. Be careful not to burn. Add butter and olive and saute until onions are translucent. Add the cup of rice and saute for 2 minutes. Add chicken broth and bring to a boil. Place on lid and reduce to a low simmer and cook for 15 minutes. Serve with Salmon. 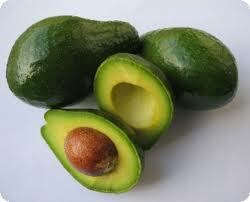 Avocado oil is my new Olive oil. It’s a tad more expensive, but the flavor is amazing!! The calorie and fat intake is basically the same.